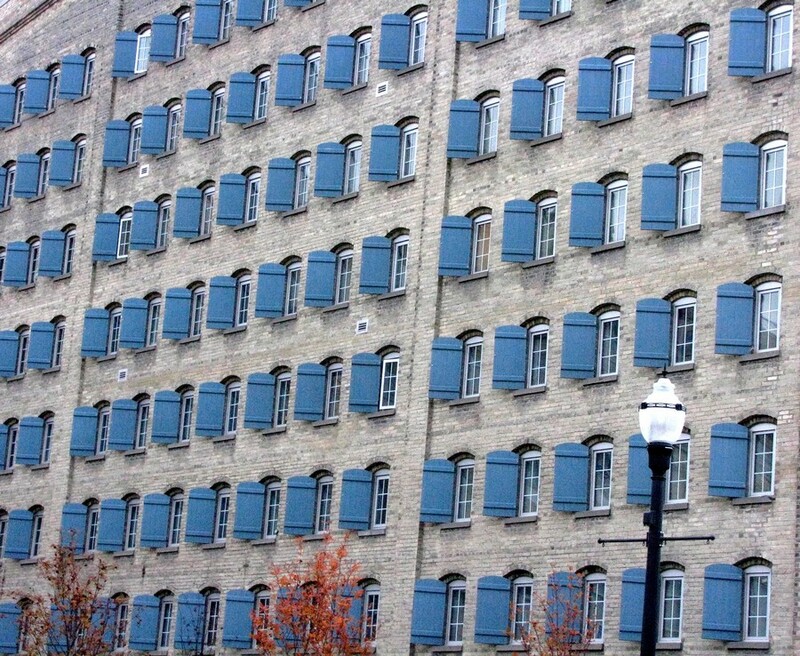 Nothing is cuter than open blue shutters. Love this! Funny how uniform it is. Happy WW! Weirdly uniform… Eerily uniform… Who opens those things to such a precise degree??? I was at an exhibition yesterday on the theme of “multiples”. Your photo would have been a perfect addition! Spectacularly precise and well-maintained place! Beautiful blue, with a bit of life & light at the bottom… Is this in Europe, Germany maybe? It could be anything from a prison to a convent (same thing sometimes)! I’m curious now as to the history of the building…. stay tuned. Also makes me think of an Advent calendar on the 24th! Lovely comment Sheila — yes, now that I think of it, me too. Wow – perfect symmetry. This has to be in Germany or Austria? I love the contrast of the blue against the stone. A lovely shot Carin! I love this. It made me laugh and it made me envious — just so cool to pick that shot out of the daytime city scene … somewhere. Where? And the red tree at the bottom, such a sweet feathery contrast to the regimen of blue shutters. And I agree with Allison above, this has GOT to be Germany or Austria! Each shutter open at the same angle. Achtung! I’m so glad you noticed the tree, Barbara! At first it annoyed me. I wanted only the windows in the shot. Then I realized the tree gave it context. And a necessary imbalance to balance the overdone ‘balance’… Easy mistake to assume Aryan origins. But it’s booze not Bavarians… [though Waterloo, so not far off!]. The former Seagram’s Building. Blue is supposed to be a tranquil colour? Symmetrically aligned and opened at exact angles like this, it is anything but. Beautiful in an awful way. I agree. It has the look of a well run insane asylum. It’s actually the old Seagram Building in Waterloo. Now housing a museum, among other things, I think. It’s interesting that three of us thought it must be Germany! OMG, Carin. I love the repetition in shape, colour and tone! At the same time, I wonder how long it took ‘whomever’ to run around that huge building to open all those shutters with such precision!